Shirdi Sai devotee Geeta Rao from US says : Sai Ram! Becoming a part of the Mahaparayan group is nothing but short of a miracle for me and I am immensely grateful to my Sai for giving me this opportunity. I have been part of this group for the last couple of months or so and beginning today, a Thursday, I am also part of a Sai Chalisa group. Thank You my Baba. This summer, my younger son took six weeks off from work. He had been working extremely hard at his job non stop almost three years and after his promotion (again Baba's grace). He took some time to visit his grandparents in India, do a short internship there, and then travel with his friends to Japan and Hong Kong. He booked his tickets from India to Japan, Hong Kong, and then to New York. Anonymous Devotee of Shirdi Sai From India Says : Jai Sai Ram, I am a Sai Baba devotee from New Delhi. Firstly, a big thank you to Sai Baba family for doing the work they are doing, binding us together in faith like comrades. The experiences that I am going to share is more of a life journey with Baba. As far as I remember, I have been associated with Sai Baba but unknowingly. As a kid I used to pray to other Gods and read 11 promises of Sai Baba without knowing Him or visiting His temple. It once happened that as a kid I visited Sai Baba temple in Rohini(New Delhi) and that's when I realised He is a God. Many years after that my family continued to follow other deity and revered Sai Baba but it was more generic; like the way we had other Gods at temple in our home. Shirdi Sai Devotee Anchal from India says : Om Sai Ram, I got married two years back, here my in-law’s family is a joint family which is very superstitious and rigid in nature. We have a beautiful bungalow built in 500 sq yards area but in a very remote and underdeveloped area of north Delhi. I prayed daily to Baba to get us shifted from there as there we couldn't even find any neighborhood market or anything. It felt like living in a jungle. Nobody in family wanted to shift and kept saying 'we are living here for ten years what about the respect we have earned here and gave many other silly excuses. Shirdi Sai Devotee Rashmi from India says : Om Sai Ram everyone. This is Dr. Rashmi here. I am part of Mahaparayan, AASM, and many other groups. I have already shared on how I got government job after 9 weeks of Mahaparayan which was also published. I got to know about Bramhamuhurtha khichadi parayan recently. I was skeptical of joining due to my work load and many other doubts. I was down with dengue fever in June. Every week my health was deteriorating. One Sai devotee Vimitha ji, whom I consider as my elder sister, advised me to be a part of BMP khichadi group. I felt maybe it's Baba's will, that I should join now. Due to some unavoidable reasons it took me a month to join BMP khichadi. I was worried that Baba might be angry with me that’s why there was a delay. Shirdi Sai Devotee Arivalaki Chandrasekar from India says : Dear devotees, I would like to share a wonderful leela of Baba which I have experienced few months back after my abroad journey. I had been thinking to write about this for many days but doing it now without further delay. I started my journey in the month of July and on reaching the destination I realised that one of my suitcase didn't arrive in time. I informed the authorities and submitted a form explaining the same. I was praying to Baba that I should get my suitcase back with all my belongings. Waited for a month and found that it couldn't be tracked at all. I actually carried all some important stuff in that along with lot of groceries in that. Shirdi Sai Devotee Haripriya from India says: My name is Haripriya from Chennai and I am blessed to Be a participant in the Mahaparayan group MP-221 of Deepaliji. I would like to share my experience of Baba's infinite kindness and grace. I was doing the Sapthaha of the Satcharitam for the second time when a very kind friend of mine mailed me to say that she had included my name in the Mahaparayan group. She knew I would be only too happy to join. I did not dedicate my weekly reading for a specific purpose but felt an immense peace in the reading of my allotted chapters. But I did pray that Baba should show the way to solve my problems. Shirdi Sai Devotee Tanu Sehgal from India says: Om Sai Ram to all the devotees. I, Tanu Sehgal belong to the MP-328 group. Me and my family have been ardent devotees of Baba since the last few decades. I recently (August 2018) came to know about the Mahaparayan from a fellow devotee and friend. It has just been 2 weeks since I started with this practice. I had heard about a lot of miracles happening with people but I didn’t know I would be the chosen one as well, that too, so soon. I have a court case going on for which I was supposed to appear in the court on this Thursday(my 2nd week of reading the Mahaparayan). I had read my allocated chapters before going to the court but couldn’t find any hidden message hinting at anything which I was hoping for. Anyway, by Baba’s grace the court date went very well for me and while coming back I had to collect some important documents urgently from some other branch in the court. I got inside the room along with my dad, who is a devotee too. We saw a man amongst many others in that room. Shirdi Sai Devotee Ridhu from Australia says: Sairam dear devotees. I wanted to share my experience which happened yesterday (30th Aug 2018). I am very lucky to be part of Mahaparayan. I have many other experiences but I would share this one first. I am married from last 14 years and I have a very nice and cordial relationship with my in-laws. I consider them as my parents. They keep on visiting us from India and also they help me a lot in looking after my son. Anonymous Shirdi Sai Devotee from US says: Sairam, I am from MP-98 group. request to have my experience posted as anonymous devotee of Baba. I want to share two of my experiences during the course of doing the Mahaparayan over the last 9 months. These have some parallels to what was also narrated in the Parayan in chapter-11 where Baba demonstrated His control over the elements of fire and water and how He saved the devotees from fire and cyclonic storm conditions. One of the evenings unfortunately our neighbour’s house caught fire in USA. By the time we saw the fire, the fire already had spread out. The fire was very close to the fence, which borders both of our houses. We immediately called 911 and ran out of the home for safety as the fire spread out and was in full force. We thought we were going to lose the home and everything that was in the home given how fast the fire was spreading and our house being very close to where the fire was. There were flames all over the neighbour’s house and yet it stopped very close to the wooden fence even though the fence was close and literally only few feet away. 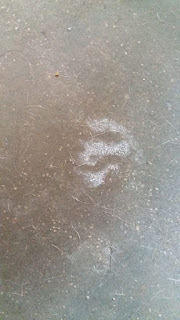 I felt as if Baba drew a line and was protecting us from the fire. The firefighters battled for more than an hour to stop the fire and the neighbour’s house was gutted. But Baba saved us from that big mishap unharmed and there was not even a small damage to our home even though the fire was so close. If I look at the line of fire, it is very clear Baba was there protecting us every second from it and it literally felt that Baba drew a line and stopped the fire spreading to our side of the house. 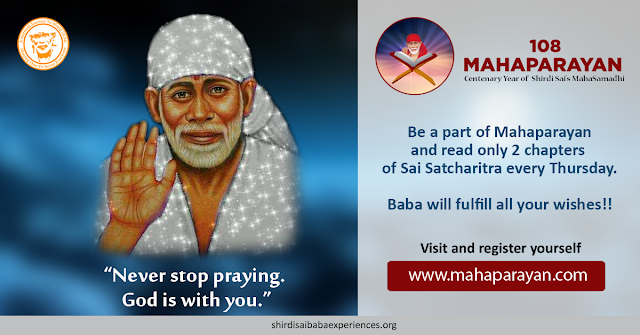 Anonymous Shirdi Sai Devotee from US says: Sairam, I want to share my experience. As I met with couple of accidents and so due to fear I didn’t give my written exam for learners permit these many months. Where in States its mandatory to learn the car and survive on our own. Shirdi Sai Devotee Ritwik from India says: Om Sairam to all devotees ! Om Sai Rakshak Sharnam! H1 : Baba entrusted me the responsibility to make a Half Yearly report(H1 report) for the Chairman though there are many reporting levels between us. Wanted to give it a great shot as it was to be submitted to the Top Management. Told Baba even from heart that I am surrendering heart and soul to You and You will only be preparing it. And lo behold! It came out superbly miraculous. Similarly, Baba prepared an article too for my reporting manager. Shirdi Sai Devotee Subha from USA says:Om sairam This is one of a recent experience happened with my friend’s daughter. I had prayed for her before the parayan day and on the parayan day after the parayan that had been my prayer. 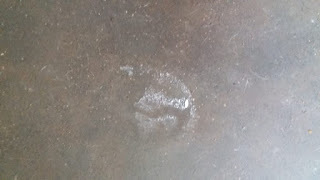 My friend’s daughter is 5 months old and was having bad gas problem and was spitting lot of milk. She was really worried about it because whenever the baby gets gas in tummy she used to cry a lot and seeing that my friend would also cry. They went to the doctor and doctor gave medicine for it and said that when gas comes she should give massage on tummy. It was ok sometimes and she used to get it because it had not got cured completely. She had to go to India permanently and baby’s health condition was not good. I was praying Baba then and there when I heard about the condition of the baby. Shirdi Sai Devotee Susama from India says: Om Sai Ram. I am roll no.9 of Mp group of 326. I am 35 year old woman without marriage relationship, my life is full of problems and struggle but Sai has been with me in these 7 years. I was doing a teacher’s job at residential job that was also got by Sai and Dattaguru’s blessings. I spend there one and half year, life was compared with military life as no sleep and no proper food but only and only work was there. I used to every day light lamp and fight with Sai asking “what life You have given me” ? but dear devotees Sai has divine and bigger plans for our future life come what may so do not lose faith on Sai, hold Sai every moment. Shirdi Sai Devotee Chitra Jagadesh from India says: Om Sai Ram. I am Sai Chitra from Chennai. I am in MP-325 group. 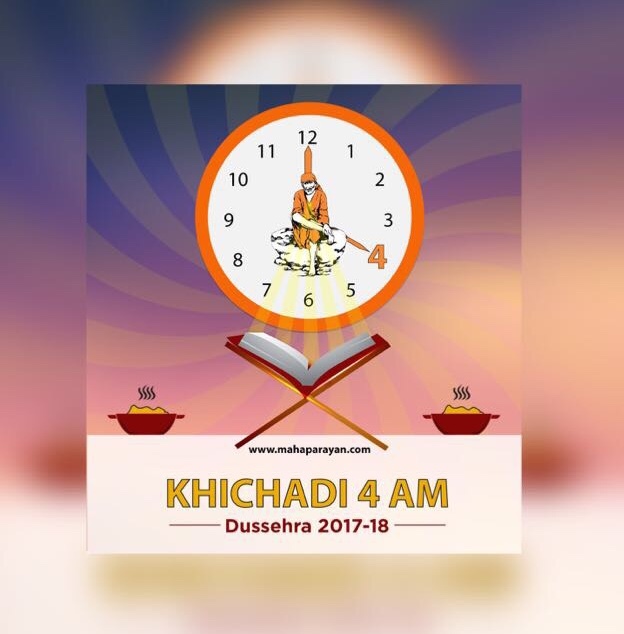 On 19/7/18 Thursday I was doing my parayanam at 4 am and after that I posted in the group. Suddenly I fell on the floor due to giddiness (like someone pushed me) unable to explain in proper words. From 4.30 a.m. to 6.00 a.m. I slept. Suddenly I woke up at 6 am. 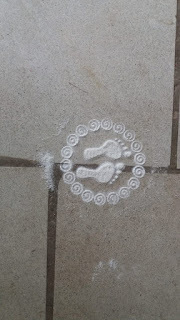 Before starting parayanam I made Rangoli footsteps (kolam with kolam mavu) at my home entrance. After I woke up I noticed kolam footsteps everywhere in my house. 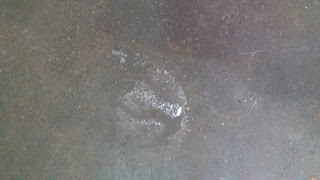 But in the entrance kolam steps were not disturbed or scattered but footsteps were everywhere in my house that was not distributed. Some of the pictures I'm attaching here. After half an hour the footsteps vanished. I believe only Sri Sai has come to our house, a picture was clicked by me at the entrance which are attached here with the post. Chitra ji how blessed are you and your house to have our dear Sai's visit just as the stones, grass and leaves of Shirdi for they could kiss the feet of our Baba. The fact that the rangoli at the entrance was intact and the footprints with rangoli in the house disappeared too after some time also confirms the same. Baba says He is hungry for bhaav and anything that is offered or made with love for Him (just as you made rangoli for Sai at 4 am) is accepted by Him no matter how small or big it is. Sai our Maa Lakshmi too, we pray to have darshan of Your foot imprints and thus feel Your presence, grace and love on Your devotees. Let them ever be with us till we leave this worldly attire and also post our soul departs from this sansaar and merges in You forever. Love You Deva. JAi JAi Ho Sai. Shirdi Sai Devotee Yeluri Murthy from India says: Om Sai Ram. I was a member of the Mahaparayan and been learning from experiences every nook and corner of the world shared during this Mahaparayan. I was wondering everybody is sharing their experiences and till date I didn't get one which is creating a doubt in my devotion towards Sai and I was very much in doubt whether I was doing the parayan in a routine matter or with devotion. Shirdi Sai Devotee Moumita Ghosh from India says: Om Sai Ram. I wish to share my Mahaparayan experience with you all. I am from MP-140 Mahaparayan group. My experience goes like this. Today morning my Maa was searching her voter ID and she was not getting at all. I and my Maa searched almost everywhere in our home but our search was in vain. Then I remembered that "If Baba is here why to Fear". I said, “Baba, please help me to get the voter ID. I am Your daughter right?? So please bless me with my Mahaparayan miracle”. The time I said this and was talking with Baba I kept on searching my bag for the ID and lo!! finally I got it with Baba’s grace. Shirdi Sai Devotee Appu Vuppala From USA says: Om Sai Ram. We live in USA. Baba gave us fulltime job and a new house last year May. Suddenly one day this April, my husband came home and said in his office they removed around 200 people from the job and he also had got laid off. We were in a shock for some time. But after sometime myself thought that I am doing Mahaparayan and Baba only gave us everything, now Baba only will show us a solution. We didn't even imagine, that next day CEO called my husband and he told that they want to take my husband back to company through a different vendor. We got relief but my husband was still worried about filing his H1 with different company. Because so many cases were getting rejecting these days. The new company filed his H1 but he got RFE. He got more tensed. Usually I get a lot tension for small things. But from the day I started Mahaparayan I am worried for nothing. But by seeing my husband and listening so many stories of other people I used to get little tensed but still I used say my self that Baba will take care. Shirdi Sai Devotee Charishma says: Om Sairam. This is Charishma, from Mahaparayan group MP-101. My husband and I were trying for a child since September 2017 and every month from January of 2018 my pregnancy test came negative. During the last Tuesday of Feb I visited the temple and prayed Baba to bestow his blessings on us with a healthy child whenever He felt that the time was right. I also prayed that he or she should follow Baba and His teachings. On the way back home my husband reminded me to test the next morning and I forgot. On Thursday morning, March 1st we were delighted to see the test come positive. After bathing I went to read my assigned chapters and Baba had allotted chapters 14 and 15 to me. Chapter 14 is where Baba blesses Ruttonji of Nanded with a child. I felt as if Baba was telling me that it was His blessing and cannot narrate my bliss-fullness in words. 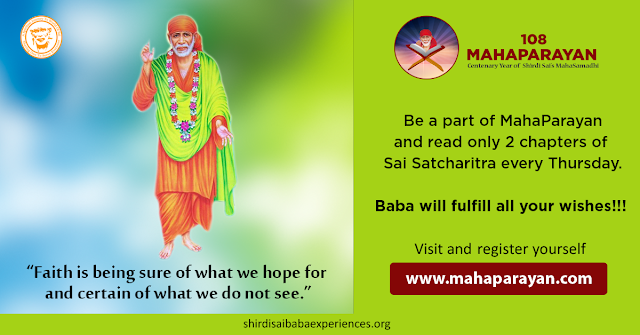 The above experience is a testimony to Baba’s omniscience. With His boon bestowing hands on me and my family I feel forever indebted to Him. With His grace I am due in October 2018 and continue to seek His blessings for a smooth delivery and a healthy child. The chapters that we read as per the allocation are actually allotted by our Sai. He decides who will read which chapter when and where and in what circumstances. Aren’t they enough for us to understand that Mahaparayan is really a blessing for Samasta Loka with our single Director Sai? Love You Deva. JAi JAi Ho Sai. Anonymous Devotee of Shirdi Sai From US says: Om Sai Ram. I am from MP-128 group. I would like to share couple of experiences which happened during Mahaparayan. 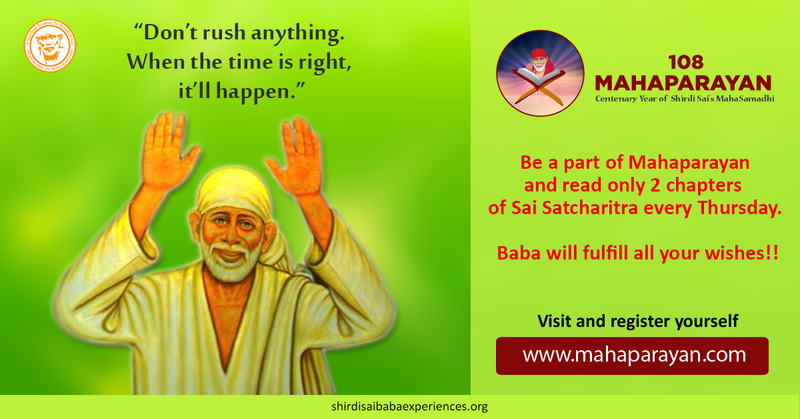 Firstly thanks to Baba for making me part of the MP group and so many other Sai groups. During the month of November 2017 I went for the routine check-up and doctor found small cysts in my liver and told that they were not harmful at all but I was very anxious and prayed to Baba to remove those cysts and would post the message if it comes true. Can you all believe it that my loving Baba did remove it as when I did the tests again recently in June 2018 they were gone and the reports were normal. Shirdi Sai devotee Anusha Appana from US says: Sairam Hetalji. Om Sai Ram, I am an ardent devotee of Lord Dattatreya Swamy. He has been helping me all my life. I stumbled upon the post about Mahaparayan in a local group and joined. Baba pulled me into Mahaparayan, I am a class teacher of a group and a captain of another group. He also pulled me into Nityaparayan, Stavanmanjari parayan, VSP parayan, Lifetime parayan, KNM group, Datta parayan group and Siddha Mangala Stotram group. After joining Mahaparayan, I had so many experiences. I would like to share a few. We went to Shirdi in November 2017 after almost 7 years and that trip was the most memorable trip for me. I didn't know that rules had changed and we have to book for Arti beforehand. We reached Shirdi on 24th night at 10 pm. Then on 25th morning by the time we went to Darshan it was almost 11 am. We took NRI Darshan and so it was very quick. We finished Darshan in 10 minutes. I was hoping to see Aarti which didn't happen and we had only Dhoop Aarti left as we had a bus back to Hyderabad at 9 pm. Shirdi Sai Devotee Arivalaki from India says: Hi Pooja sis, I am the class teacher for MP-58. One of my team member has shared her beautiful experience she went through after joining this Mahaparayan journey. 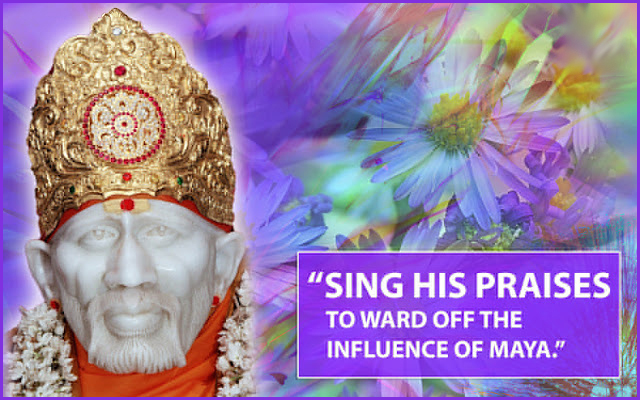 I would like you to acknowledge this and share this with other devotees to create more faith in our Sai. Here is her letter. "I am Archana a Sai devotee from Bangalore. I want to share an experience that I had on 16th of April 2018. My daughter adopted a stray dog from a shelter on 13th of April. 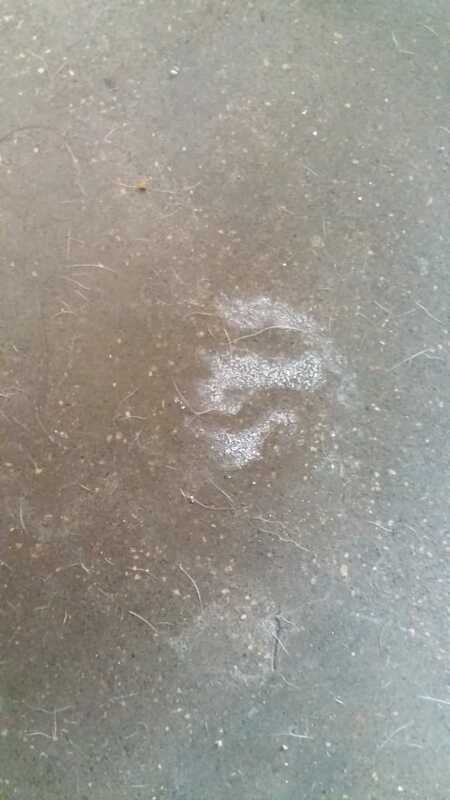 On 16th April the dog was alone at her house as she and her husband had gone for work. I told my driver to go to her house and take the dog for a walk. The dog got scared and ran out of the house as soon as the door was opened. The driver ran behind her and could not find her anywhere. He called up to inform me and all of us (my husband, son- in- law , daughter and I) rushed home from office. Shirdi Sai Devotee Rachana Gollapudi from US says: Sairam everyone. I have been a devotee of Baba from about 9 years now. I live and work in the US and had been working for my firm for 10 years when I decided that it was time for a job change. My projects weren’t going well, I wasn’t able to perform well due to lack of interest in projects that were not in my area of specialty. This was around May/June 2017 and I started applying for jobs elsewhere. I also got through some rounds of interviews but nothing was materializing. I had applied into a company that was my top choice and after successfully completing many preliminary rounds, I did not make it to the final ones. I had asked Baba for an indication (for this company) and received a positive response and when I didn’t make it in the interviews, I got confused and was filled with negativity that, even after getting a positive indication from Baba, the job didn’t come through. I couldn’t believe that Baba had indicated something that didn’t come to pass! I started questioning my faith and my beliefs. I was pretty much in depression by Aug/Sep. Shirdi Sai Devotee Geetha Venkat from India says: Sairam everyone. I am from MP-136 Mahaparayan group. Truly to say I have became Sai Baba's ardent devotee only since couple of years. Even though from past four years I go to His temple, but not sincerely prayed to Him. Slowly Baba pulled me towards Him and started showing me various miracles in my life. It was my sister, who said me about Mahaparayan and made me to join in Mahaparayan group. After I started this Mahaparayan, I am hearing only positive and good news in my family. 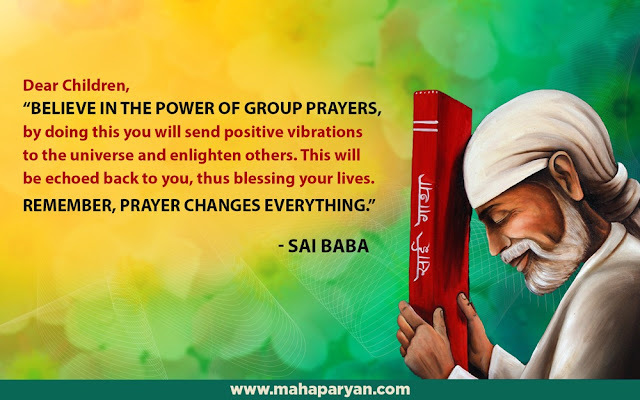 Truly Mahaparayan is a blessing and whoever are part of Mahaparayan are really blessed by Baba. Shirdi Sai Devotee Susama from India says: Sai Ram, I am a member of MP-326 group, roll no 9, house - red. I am small devotee of Baba. During Mahaparayan time once I was in problem in my school teacher’s job because without previous notice I stayed in my sister’s house for 3 days.While I was leaving for my working place one bus was passing in front of me; in this I saw a Sai Baba photo and under it written, "Stay confident in every situation and you are nearer to your dream”. Then I felt Sai is with me. While travelling that day Sai helped me through bus conductor for toilet because I was travelling alone in night time. Then my phone was switched off, with the help of 3 persons I was able to call my sister. Sai Baba is great. That day was a fearful night for me and at every step Sai helped me greatly. Sai’s words are never untrue without notice I had stayed and that school staff would be angry on me. Anonymous Shirdi Sai Devotee from India says: Om Sai Ram. I wanted to share a beautiful leela of our dear Baba that happened yesterday. I always wanted to have Baba's dress which He wears in Shirdi Samadhi Mandir as a gift from Him. Like a child I used to imagine someday any pujari will give me Baba's dress or some miracle will happen in Shirdi, that in any form Baba will come Himself and give me His dress as I don't want to buy but wanted from my Baba only. Yesterday a beautiful incident happened. 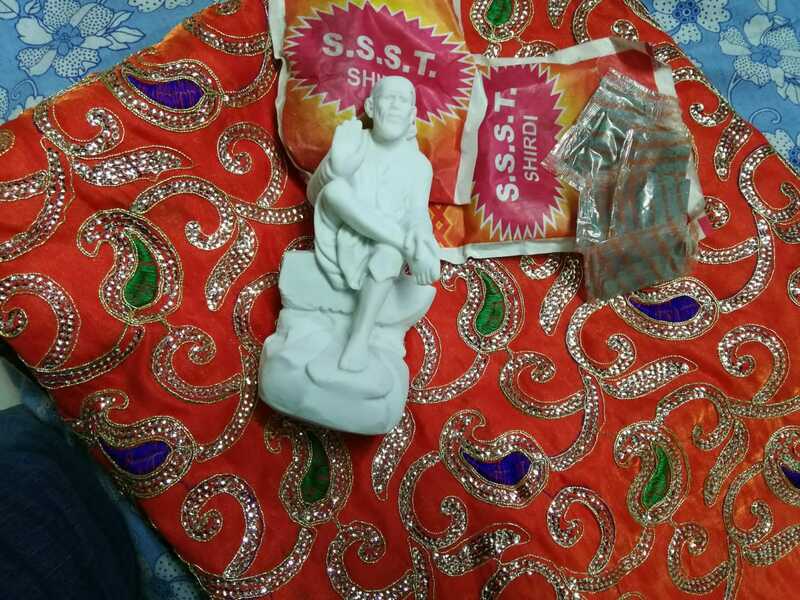 When I went to meet one of my Sai sisters, she gifted me a Beautiful Dress of Baba which He had worn in Shirdi Samadhi Mandir along with lots of Udi packets and Prasad. I don't have words to describe it. Baba read and knew the desire of my heart and fulfilled it. It was such a beautiful feeling, getting so much love from Baba and meeting Sai sister for the first time. As it was too late in the night around 1 am and as her train also got delayed due to rain and in Pune it was raining continuously, so the chances were very less that we would meet. But Baba knows how to plan everything. He planned it so well and His plans are always perfect. The best thing happened is when her mother and father offered me Baba's statue too; I said uncle, "I already have many Baba's idol as we stay in Pune and we frequently keep on visiting Shirdi by Baba's grace, so you can gift it to those who don't have it". But he said, "When Baba wants to come to you, why do you say no?” Then he took out the statue and gave it to me and I realized that it's Baba's statue with blessing hand. I was speechless, as I don't have Baba's statue with blessing hand. Although I have one picture like that, which is again a surprise gift from another Sai sister but this was the first statue which I got it with Baba’s blessing hand. Everytime Baba has proved that He is ever listening to us and listening even our thoughts and silent prayers. Lots of love and gratitude to Baba and to my entire Sai family. Baba bless us all. Jai Sai Ram! Baba loves You so much. It’s a great blessing to get His clothes worn by Him in Samadhi Mandir and that too as a gift! Unless He wills who can get Him to us? MAy Baba shower His such love on all His children who are waiting like the chatak bird during rains. Love You Deva loads. Jai JAi Ho Sai. Shirdi Sai Devotee Shanthi Madhukar from India says: Sai Ram everyone. I would like to introduce myself as Shanthi Madhukar from Bangalore. My whole family is doing the Mahaparayan which includes my sister and her daughters too. My daughter who is presently residing in Germany is doing the parayan in another group. Where we're doing the parayan doesn't matter at all, the miracles that we actually experience while reading the Satcharitra is what matters. And that is what makes us even more firm in our faith and devotion and that actually matters. I would like to share one such experience with you all. Inspired by the Satcharitra, without even discussing with anyone my daughter just took a vow not to eat sweets for 9 weeks which she started on a Thursday. After avoiding sweets for about 2 or 3 days she told me about it. Things were going smooth and she was doing it fine avoiding sweets. Yesterday they had to attend a party here and both my daughter and son-in-law left for the party. It was an Indian association party and seeing the Indian friends the chatting and laughter went on and dinner was being served. They were offered plates where everything was served moderately and passed on to the members. But when my daughter received her plate, her plate did not contain any sweet in it; whereas the others had got plates that had sweets. A friend told my daughter that her plate had no sweets and that the caterer missed it and asked her to get some. My daughter just walked across to get the sweet forgetting her vow. But the moment she reached the counter she remembered her vow and she was blank for a few seconds. She was not able to understand anything. Baba had understood her state of mind that she was enjoying with her friends and had sent a plate to her without the sweets but when she went to get it, He made her remember her vow. Shirdi Sai Devotee Srujana from Europe says: Om Sai Ram. I am Srujana member of MP Europe group. With my sister’s influence, I started believing Baba from past 5 years when my chronic 8 years wrist pain was cured with Baba’s Udi. After that I experienced several situations As he is with me by giving me solutions to all my problems of job, health, domestic help, house and family life. I did Sai parayanam whenever I got chance. Registration in MP group itself shows that Baba is with me. I was not knowing about MP groups formation and back ground behind it until 1 day before the registration were closing. My neighbour Anu called me 1day before that she got chance to be a part of MP and there are 1 or 2 vacancies left. She put my name forward and I immediately got call from Shylaja ji for the registration. Felt so blessed as Baba made me part of MP family. I immediately suggested my sister's name and she also luckily became a member. We have one daughter of 7years old and was thinking of planning for second one from past 2 years when once the house and job had been sorted out. Luckily both got materialised last year and we started planning for second one. But I didn't conceive for nearly 8 months. After I registered in to MP, really I can say it was a miracle if you read this. The first MP chapter that was allotted to me on Dussera day was Chapter 36 where Baba promised to a lady that before 12months she will deliver a baby boy. Exactly the same happened to me. After 4 days my pregnancy result was positive and last month on 29th May we are blessed with a baby boy . See how Baba hinted and blessed us at the start of Mahaparayan. At the same time during last year Dussera, myself and mother’s family was in big shock as one of my closest cousin passed away unexpectedly with heart stroke. She was very happy, friendly and was helpful to all relatives. Don't know how everyone could digest and come out of this situation. My mother is very close to her and used to share every good and bad with her. She was crying badly and getting depressed day by day. Since I was in UK and conceived at that time, I couldn't travel to console my mom and relatives. I was just praying Baba to take care of her health and asked her to believe Baba to give enough strength. 2 months after that I forced my mom to do general health check-up. Nothing much to worry but doctors suggested for uterus removal. Her both daughters (me and my sister) are in UK and both couldn't travel to India. We were worried how she could able to manage without us. I completely surrender myself to Baba, prayed Him to be with her and take care of her. With all His blessings, our relatives and her friend stood by her support and laproscopy surgery went well. After one month she could travel to UK and supported me during my delivery time. I would like to thank Poojaji, Hetal ji and everyone who struggled hard to form these MP and Naam jaap groups by making thousands of us happy with blessings of Baba. Please post this in MP experience. Om Sai Ram! Baba’s ways are beyond our human intellect. It is Baba Who decides who will read what chapter when, where and in what circumstances. His timings are just perfectly perfect! Mahaparayan is a true blessing from Baba for His children in this Kaliyug. Love You Deva. Jai JAi Ho Sai. Shirdi Sai Devotee Manibala from India says: Sairam all. I am Manibala from MP-142 Group. Since some days I was following dreams of all Gods. Even yesterday night (30-01-2018) also I got a dream. In my dream I was traveling to some place and I got down somewhere. There I saw an ancient temple which consisted of Subramanyeswara Swamy, Lord Shiva and Ganesh statues in that temple. There some Pooja rituals were going on. Later on after some time I went to another small temple and inside the temple I saw there were many books and religious things. There again I saw Lord Ganesh statue and Lord Shiva linga. Pujari came towards me and said about one picture which was hanging on the wall and that picture was of Baba. It was the picture of Baba grinding the wheat.In that picture Baba had worn a stone studded necklace. The pujari showed the real necklace to me; the one which Baba had worn in the picture and I touched it too. At that moment I woke up and felt really shocked.